My anatomy students learn the heart every year which ends with the dissection of a preserved sheep heart. 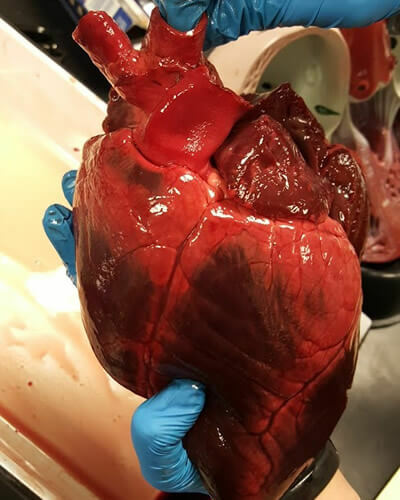 This year, a hunter friend brought me a fresh deer heart which I was able to dissect in front of the class to show my students how the deer heart compared to the sheep heart. There isn’t much difference, except for the size, and of course, the amount of blood. As shown in the photos below, some of the features are similar, such as the interventricular sulcus on both the sheep and the deer. The deer photo shows more of the aorta and pulmonary arteries, though they are present on the sheep, just not easily seen from this angle. 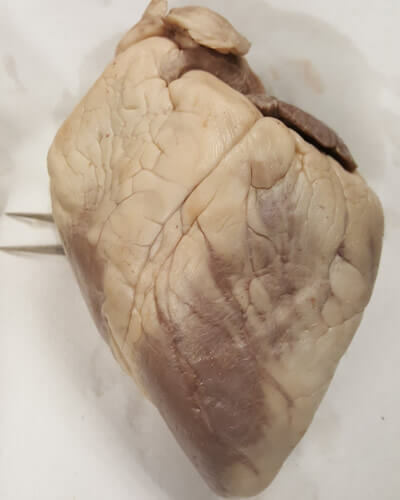 I find students need to massage the preserved hearts because many of them lose their shapes during storage. The photos do not show scale, but the sheep heart was nearly impossible to hold with only one hand. It was also quite slippery, so I was very careful when using a scalpel to cut it. The video below shows the complete dissection of the deer heart.